2014 Africa Progress Report – One Billion Hungry: Can We Feed the World? 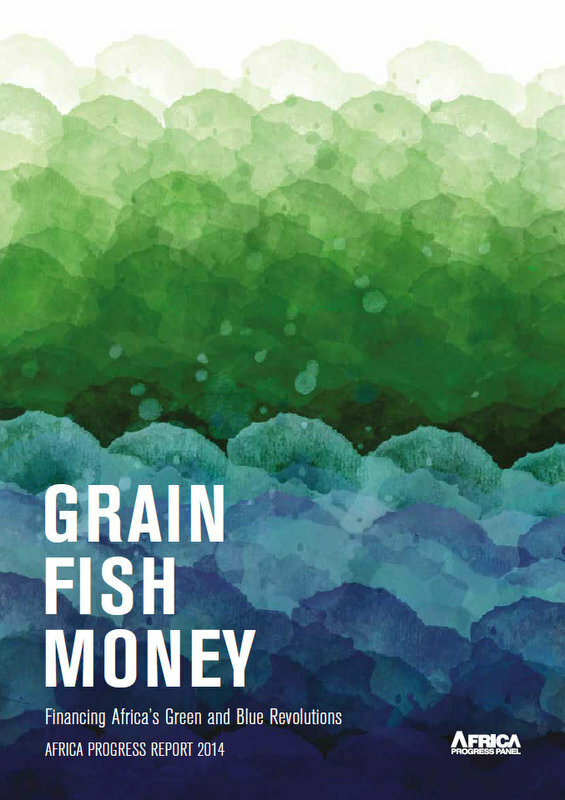 Released today, the 2014 Africa Progress Report, Grain, fish, money. Financing Africa’s green and blue revolutions, discusses agriculture, fisheries and finance, outlining reasons for optimism but also some of the priorities and barriers to Africa’s development. The Africa Progress Panel (APP), chaired by Kofi Annan, former Secretary-General of the United Nations and Nobel laureate, consists of ten individuals across the public and private sectors who advocate for equitable and sustainable development for Africa. The annual Africa Progress Report, published every year in May, utilises the best research and analysis available on Africa to make viable, policy recommendations for African policy makers, international partners and civil society organisations. Many African countries have seen significant economic development and transformation in the last few decades and incomes are set to double in the next 22 years. Senegal, for example, has gone from a debt crisis to selling sovereign debt on eurobond markets in ten years. But this economic growth is slow to trickle down to the many rural-dwelling Africans whose livelihoods are still precarious. In west Senegal, ongoing illegal, unreported and unregulated fishing by commercial fleets from other countries has left fish stocks dwindling, affecting tens of thousands of artisanal fishermen. As the report states this is just one example of the growing divide between the few who can benefit from Africa’s rising economic prosperity and the large number of people chronically poor and hungry. In order to translate some of the economic growth to improving people’s wellbeing and livelihoods, Africa’s policymakers must focus on developing the continents farming and fishing industries, those economic sectors employing and supporting the majority of the Africa population. Smallholder farmers receive relatively little support from the government. As the report states, “Agriculture remains the Achilles’ heel of Africa’s development success story.” Subject to conflicting and sometimes damaging development initiatives, African farmers have some of the lowest levels of access to productive resources, markets and technologies in the world. As such agricultural productivity is very low. As has been seen in many developed and emerging economies an agricultural revolution is essential to overall growth and poverty eradication. Africa, as the report goes on to say, needs its own Green Revolution, one designed for the African continent. In particular increasing access to technologies such as drought-resistant varieties and tackling policy and market failures, which prevent farmers from increasing their productivity and incomes. Given Africa’s reliance on small-scale farming, it is imperative that they be supported in adapting to climate change. The current financial commitments from other countries through climate funds are far short of what is needed and “Africa’s farmers are being left to cope with a climate crisis they did not create”. Although the incidence of poverty is declining, it is declining very slowly. 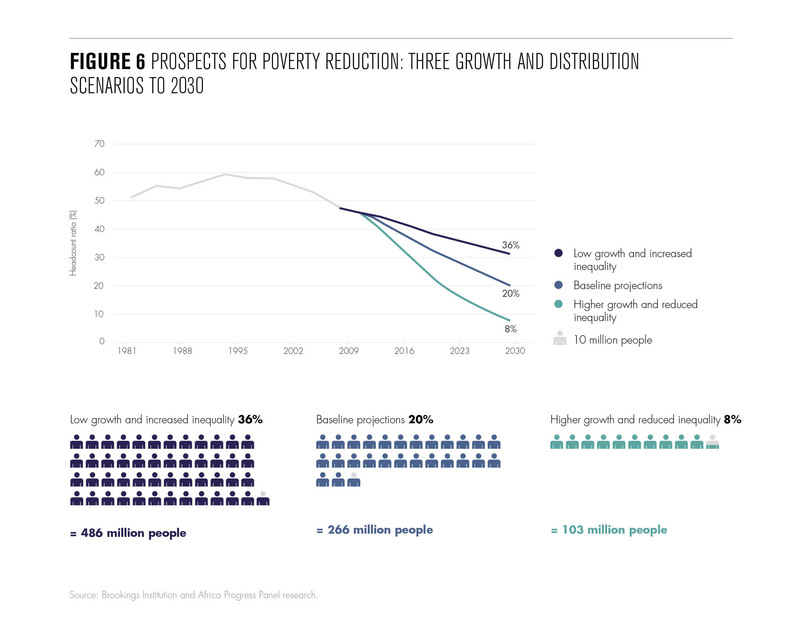 Included in the Post-2015 development goals will be a target of eradicating poverty by 2030, a goal that on current trends Africa will fail to meet by some margin. Only through increasing economic growth per capita and implementing systems of redistribution to tackle inequalities will Africa have a chance of meeting that goal. The report gives an example of the inequality of public spending with far more money being spent on energy subsidies, a benefit predominantly felt by the wealthier, than on social protection, which is important for tackling poverty at the source. The report also discusses the failure of African governments to control illegal and unregulated timber extraction and fishing, impacting local timber and fish markets and in many cases reducing local people’s incomes and access to important resources, as well as costing countries billions of dollars. So far governments have failed to address these problems and international action is on a purely voluntary basis. Financial systems, particularly poor in Africa, are also discussed. Only 1 in 5 Africans have an account at a formal financial institution. Lack of access to investment funds and insurance pose challenges for business development and farmers alike. The report puts forward several recommendations for developing the agricultural sector, improving national financial systems and protecting renewable resource sectors. Share the wealth – Inclusive growth and expanded opportunity are essential to eradicate poverty. For example setting equity targets as part of the post-2015 development goals and expanding social protection programmes and funding. Invest in Africa’s unique green revolution – African governments, the private sector and the global community must work together to invest in Africa’s unique green revolution. Governments need to act on their pledge to spend at least 10% of budget resources on agriculture, they need to create the right market conditions, reduce imports, facilitate infrastructure development and support sustainable agricultural development to fight hunger and malnutrition. 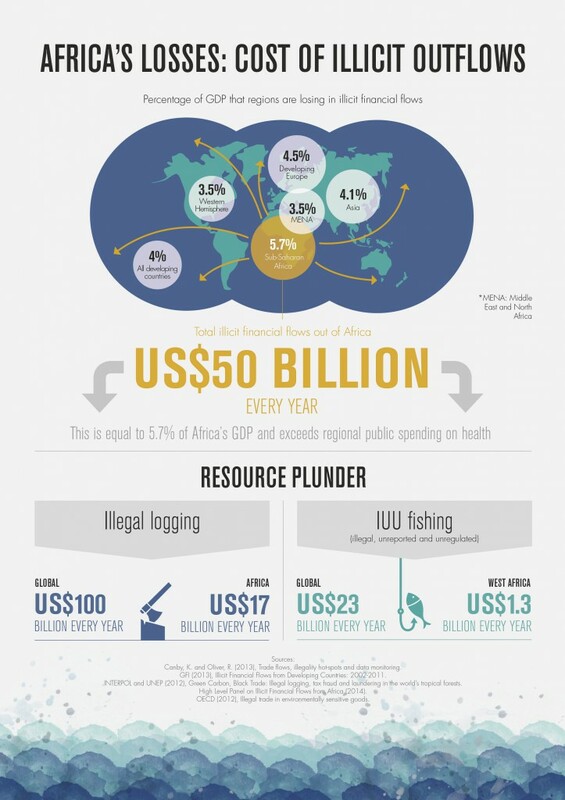 Take the profit out of plunder – Africa’s resources should be sustainably managed for the benefit of Africa’s peoples. Action to prevent the illegal exhaustion of Africa’s natural resources requires international, national and regional collaboration. The international community must develop multilateral systems that prevent the plunder of Africa’s resources. Close the twin deficit in infrastructure and inclusive finance – Regional cooperation for energy and transport projects, supporting the development of mobile banking and e-commerce and greater collaboration between private and public sectors to guide the development of inclusive financial services industries is needed. Make tax and finance more fair and transparent – Strengthened domestic resource mobilization holds the key to financing for inclusive growth, with African governments investing in efficient and equitable tax collection. Greater transparency on tax exemptions and greater efforts to combat tax evasion combined with the international community delivering on its aid pledges and cutting the cost of remittances. Overall the report is eloquent and impactful, making clear and actionable recommendations for African and international policymakers alike.